Sleep training is a hot topic here in the Western World. I even see Facebook ads popping up encouraging parents to take their specialized course on how to make their baby sleep through the night. I get the appeal, we love our sleep. When I was a first time mom I had everyone (and I mean everyone) telling me that baby should sleep in their own crib and they should not wake up at night at all, or very little once the newborn stage passed. I was encouraged to allow baby to cry so she would learn to “self sooth”. They felt that if I didn’t, I would be catering to that baby for the rest of their childhood. In essence, I was told I would wreck my child if I answered that helpless baby’s cry. Everything in me disagreed with these people. There were no words to explain what my motherly instincts told me. I tried to comply.. I mostly “cheated”. The expectation others put on my baby through me, put a weight on me that was incredibly heavy and suffocating. Their “best intentions” really stole a lot of joy from me. During a time I should have soaked up the mom and baby bond; I instead I was tying to live up tp what the societal norms were pressuring me to do! It was painful and heartbreaking trying to follow the norms and go against what my heart was telling me. My body would respond with such an aggressive need to answer my baby’s cry. Even after my 6th I still experience this. What this is, is our deeply rooted primal protective reaction! It’s something we must respond to. If your feeling this, don’t let anyone convince you to not respond or tell you that your going to spoil that baby ! There is no such thing and I am going to try to prove that in this post. By the time my baby was 18 months, I had consumed many a study on sleeping in babies. I read both sides, for and against, as I tried to grasp how my “motherly instincts” could be wrong. It wasn’t until I came across a study that showed how brain activity was affected by babies being left to cry on their own. There was a picture of brain scans showing the increased “stress” hormone of the baby. We don’t even need scientific studies to show us the negative effects of stress on our bodies. Just take a moment and think of how stress effects you. Even though the scan is that of a “neglected child”. It was enough to make me stop and consider how allowing my babies to cry was truly effecting them. And it gave me enough “evidence” to show those who were convinced I was “spoiling” my baby. Clair Niala discovers the secrets to caring for her baby after having been influenced by the Western world. ” nyonyo (breastfeed her!)”. It was her answer to every single peep. There were times when it was a wet nappy, or the fact that I had put her down, or that she needed burping that was the problem, but mainly she just wanted to be at the breast – it didn’t really matter whether she was feeding or just having a comfort moment. I suddenly learned the not-so-difficult secret as to the joyful silence of African babies. It was a simple needs-met symbiosis that required a total suspension of ideas of “what should be happening” and an embracing of what was actually going on in that moment. The bottom line was that my baby fed a lot – far more than I had ever read about anywhere and at least five times as much as some of the stricter feeding schedules I had heard about. Offer the breast every single moment that your baby is upset – even if you have just fed her. Co-sleep. Many times you can feed your baby before they are fully awake, which will allow them to go back to sleep easier and get you more rest. Always take a flask of warm water with bed to you at night to keep you hydrated and the milk flowing. Make the feeding your priority (especially during growth spurts) and get everyone else around you to do as much as they can for you. There is very little that cannot wait. Read your baby, not the books. Breastfeeding is not linear – it goes up and down (and also in circles). You are the expert on your baby’s needs. A closer look at the science of stressed babies. When a baby is left to cry, all that baby knows is that their mom, their life source, the one they need in order to survive is not close. So baby cries; an attempt to signal mom that they are in need. If mom does not respond, baby will start to stress and the brain releases a hormone called cortisol. Eventually, baby will stop crying but not because baby has self soothed. In fact, it means that baby got so overwhelmed with emotion and cortisol that he just shut down. It is translated in baby’s brain that he has been abandoned because baby’s survival relies on moms presence. Of course this is by no means the intention of the caregiver, which is why understanding things from baby’s point of view is so important. Even if baby continues to cry while your holding him/her, studies show that the stress hormone is not rampant like it would be with cry it out. So though it may feel like your not accomplishing anything, take heart, baby is comforted greatly and more importantly baby is *not stressed*, which is huge!! 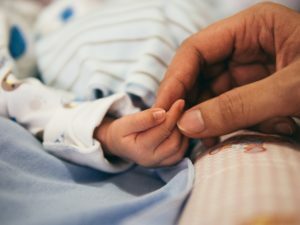 In fact studies show that babies who receive a loving response from their caregiver on a consistent basis makes for a healthier more responsive brain. When the body faces stresses, the brain activates the autonomic nervous system. This is an involuntary system of nerves that controls the release of stress hormones. Those hormones help us cope with stress by increasing the heart rate and helping the body adapt. 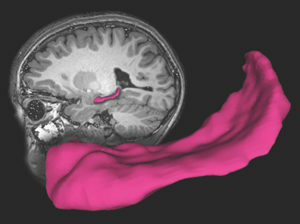 The hippocampus is the main brain structure involved in that response. 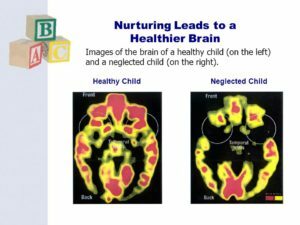 [we found children] who had been nurtured had a hippocampus almost 10 percent larger than children whose mothers were not as nurturing. In other words, this study showed that responding/nurturing our baby’s needs increased the size of the hippocampus which is a small organ located within the brain’s medial temporal lobe. It forms an important part of the limbic system and helps regulate emotions, stress hormones (the ability to keep the stress hormone cortisol in check) and long-term memory. When a baby is born, their brains are not fully developed yet. This is why some call the new-born stage the “4th trimester” because baby is still in need of connection/closeness similar to what they received in the uterus. It’s very important at this stage to almost replicate womb like conditions. Holding baby snug, skin to skin and a nurturing response with needs being met as quickly as possible. 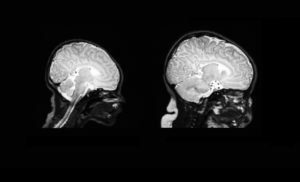 The brain scan on the left is taken from a newborn, and the one on the right is taken 90 days later. Baby’s brain develop at a surprisingly fast rate. In every moment their brains are making new connections. Every time we respond or don’t respond to our babies, a connection is made. The first year of life is a building block for young children. They will assess their safety and relational connections through the experience of their first year. This becomes a road map of sorts and the foundation to much of their lives according to Dr. Gabor Maté. Dr. Howard Chilton explains more on the developing brain of a baby and how in the beginning of life baby brains are not capable of reason! They only have access to the part of the brain that is pure emotion. Anger, fear, joy, sadness… So if baby can not see mom, they fear their very survival is in jeopardy as they can not reason within themselves that ” oh, mom is just over there, Im safe”…. Contact, touch especially is vital for that baby to feel safe. I appreciate how gentle Dr Chilton’s approach is in educating people. He has some really helpful tips as well! [When] infants wake to feed, they wake for nonnutritive purposes, too, to be cuddled and to be touched, though attributing what purpose it serves is difficult. In other words, infants are not always waking for food but, to be (quite possibly) reassured emotionally and when they awaken and subsequently mothers touch, hug, inspect or whisper to them we witness on our monitoring screens a suite of physiological changes including increased heart rate and higher oxygen levels measured by oximetry, all of which is remarkable to observe. 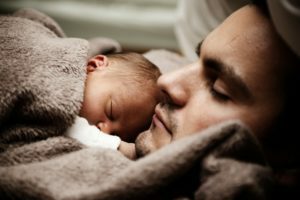 Compared with the rest of the world, our parents do carry a huge amount of baggage about how terrible it will be dealing with an infant’s sleep. Indeed, we are taught to expect an adversarial relationship with our babies (as regards sleep) even before we meet them. Due to placing infants at odds with their emotions, i.e. socially isolating them for sleep, and/or minimizing contact which is exactly what infants seek and need it is no surprise that western parents (surely the most well read and informed) nonetheless remain the most obsessed, judgmental, disappointed, exhausted and the least satisfied parents on the planet! Babies heart rate and oxygen levels increased upon receiving connection with mom!!! This especially is important to note when considering the fear of SIDS! James McKenna talks about the benefits of baby and mom being in close proximity (ie same room or bed-sharing). He came to the conclusion that both baby and mom benefit greatly from night feedings. He also notes that even mom will take part in arousing baby. He goes on to say that when mom and baby are in sync over night time wakings/feedings, even mom will wake baby naturally as its possible she instinctively knew baby was in need of an arousing! As stated in the study above, their monitors showed that when mom responded to baby in the night, either by whispering, touching, examining, nursing etc, baby’s heart rate went up and so did oxygen levels! Amazing right!! Social Norms teach us that baby is somehow manipulating us into giving them more attention than they need. The general mind set is that baby is somehow trying to take advantage of or trick us, demanding more than they require. It seems like it’s believed that they should come out with adult “emotion controlling capabilities” which is, of course, something that needs to be learnt throughout our lifetimes. Their brains are just not wired for it yet. Not to mention I know a good deal of adults that are very poor at conveying or controlling emotion.. makes me wonder how or if they were responded to as babies??! I myself can get lost and “over” emotional and I have years of life training. In fact, this post is causing me a good deal of emotion right now.. ha!! Our babies seek and NEED connection. Without it they instinctively know they will die. I’m sorry but society is wrong in this presumed “sinful/tyrant” nature of young children. They are not born with a need to piss us off, trying to get more than they need. They just Need.. end of story! Ok.. I’m off the emotional rant and on with the science and studies. 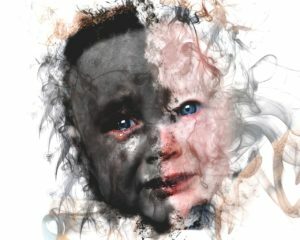 Evolutionary Parenting has an excellent article, exploring in even more depth the effects of the “cry it out” method. She refers to it as “extinction” sleep training, however, this is just another term for Cry It Out, they are one in the same. Attachment is Seeking closeness and proximity. Attachment is survival. A large part of the bran is dedicated to attachment. Attachment dynamic is the most important dynamic in life. Think for a moment of what is the worst thing that can happen in your life? For me it would be loosing a child! This proves that Attachment is most important. Relationship is infinitely more important than any action. Dr. Gabor Maté co-wrote the book Hold Onto your Kids. He focuses on attachment and ADD. He talks of how many behaviors all come back to relationship/attachment issues and how it starts very early in life. Responding quickly to a baby’s cries is the best way to show her that she is safe and loved. It should not be confused with “spoiling”. Babies cannot be spoiled. When they’re sick, upset or distressed, they need to know that you are there for them. Attachment involves two people interacting, sharing, and connecting. So as you respond to your baby’s needs, your baby will respond to you: You’ll notice that it becomes easier to soothe her, that she wants to be near you, and that she reacts to you even from a distance. Holding, rocking or talking softly to your baby all promote attachment. I have found this to be very true with my 6 kids. In fact, I found the babies who I responded to quickly to be much calmer babies than those that I didn’t respond to as quickly. I am getting compliments constantly on how quiet and calm my 6 month twins are and I am convinced it’s because I meet their needs as quickly as I am able. Remember how baby brains are making connections constantly? If their experience with connection has consistently told them that their needs will be met, they will usually take much longer to get worked up. If however, the connections have told them that they will not get a response until they are entirely worked up or not at all, they will skip the working up stage and go directly into “stress” induced panic screams. So really they’ve been trained to “react” instead of “communicate” by first whining/trying to get your attention etc….Does that make sense? In essence you want to become a student of your child. Get to know them, follow their lead. You will be amazed at what they will be able to communicate when you take a stance of “partnership”, working with your baby, meeting their needs as they come. Nurture your relationship with them even at this young age! Having said all this. If you’re in a moment where you feel your just to overwhelmed and fear possibly causing unintended harm, please ask for help and/or put baby down in a safe place such as a crib or play pen! Caring for babies can be beyond exhausting.. any mom can totally relate to these overwhelming feelings!! So please know you are not alone!! Here’s some awesome links for further reading!